Portugal has its Posadas, Spain its Paradors. Greece has its Traditional Island Houses, Turkey has Cave Hotels in Cappadocia, and Morocco has its Riads located in the Medina or Old Walled Town. Each of these countries has found a way to introduce visitors to their authentic cultures by converting modest traditional homes, or castles, or opulent residences, into accommodations for the travelers who seek to submerge themselves to the ancient ways. 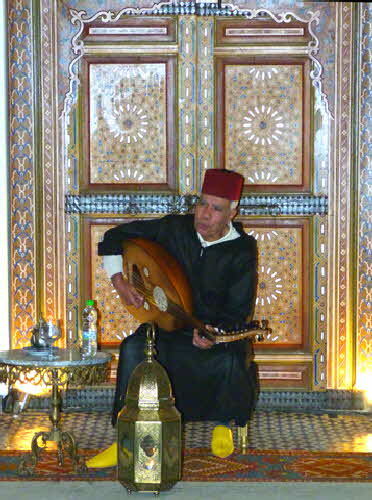 It’s lovely to be pampered at a five-star luxury property or share a personal experience with locals at a Bed & Breakfast, but a visit to Morocco is not complete without a stay at a Riad. 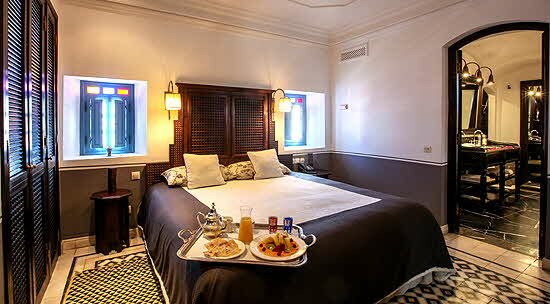 On my recent trip we stayed at two very different luxury Riads; one an 18th century converted traditional private home in Fès, Riad El Amine Fès and the other, a Relais & Châteaux restored 18th century property, Heure Bleue Palais, in Essaouira. Our driver drove us to a narrow unlit area of the Medina in Fès and deposited us into the hands of a fashionably dressed gentlemen who introduced himself as Yassir M’hammed Jawhar, Président, Director Général, Chairman & CEO of the 18th century “maison traditionnelle” Al Amine. Yassir shepherded us down the dark ally to a non-descript doorway, not exactly what I had hoped for but once he opened the door and invited us to enter, my breath caught at the scene before me. We entered into the central courtyard supported by columns of vast height and covered by brilliantly colored tiles; the floor also was tiled in an intricate pattern and in the center stood a fountain also covered in decorative tiles. 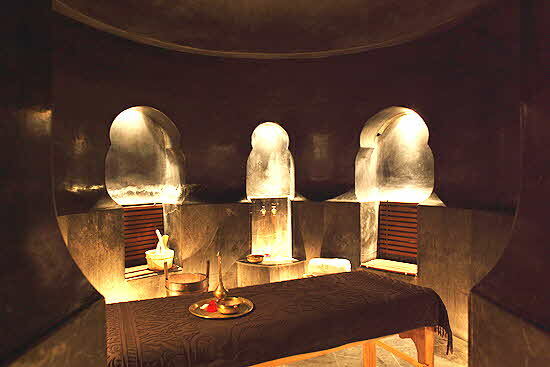 All traditional Moroccan homes have an interior fountain representing the waters of life; many are seated inside a five-point star for the five pillars of Islam. There was a lovely scent permeating the air that made the room seem all the more exotic - more about this fragrant aroma later. Massive doors leading from the central courtyard were intricately carved with decorative brass handles that led into another large area featuring an interior swimming pool. Smaller rooms surrounding the courtyard and the pool, were beautifully decorated and served as sitting areas or dinning rooms. One evening we had dinner in one room and the next morning we had breakfast in another of the colorfully decorated side rooms. Dinner was traditional with a series of small plates for starters with home made bread for sopping up the delicious sauces: beet, eggplant, potatoes, beans, cauliflower, pumpkin, etc. The entrée consisted of fish and chicken, also dancing in flavorful sauces that encouraged dunking. Dessert was a large bowl of fruit, rather than a sugary concoction, and the ubiquitous mint tea that delights tourists by being poured from a spouted teapot from on high. Yassir and his staff were so welcoming and captured perfectly the raison d’etre of the spirit of the Riad concept by making their guests feel like members of the family. When we left or returned to El Amine we were always greeted and warmly welcomed. In a traditional house one part is reserved for the owners with stairs leading off the central courtyard to their private quarters and the other part of the house is for visitors. In the day before hotels, complete strangers could knock on any door and ask for accommodation. 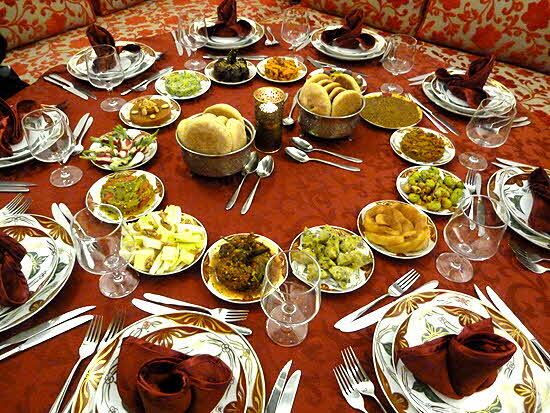 It was the custom to invite the travelers in and for three days attend to their needs. No one was refused but after the three days they were no longer welcome and had to move on. Now, to the fragrant scent that wafts through many public buildings and is called Rose Water, which is a misnomer, because this light, lovely, fragrance is made from the blossoms of the sour orange tree. In the spring the blossoms are collected and distilled in a three pot system; one holds the blossoms; one holds steaming water to extract the essence and the third collects the fragrant water. Almost every home makes the Rose Water in quantities that last all year long. 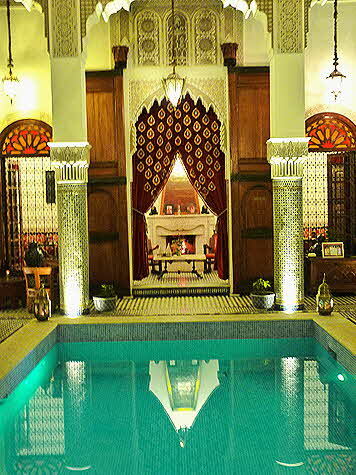 Built at the end of the 18th century as a sumptuous residence for the Mayor of Essaouira - whose portrait currently graces the reception area - the building is located just inside one of the main gates leading into the Medina. At one time the property served as an orphanage but by 1960 it was abandoned. It was eventually acquired by the prominent Azoulay family who restored the existing building to its former grandeur and added two new floors plus a pool and roof garden and bar, while maintaining the integrity of the original design. Due to the extended height of the building there is a lovely view from the roof overlooking the Medina and the ocean in the distance. 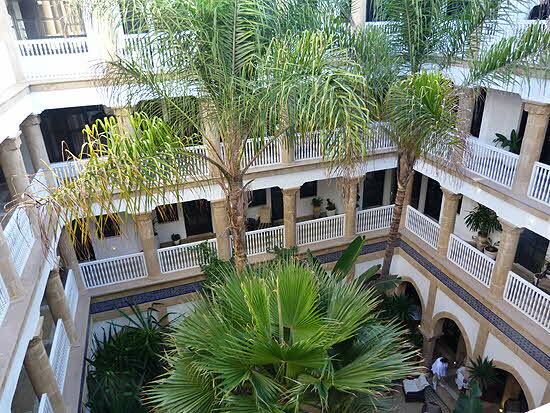 After three years of renovation Heure Bleue Palais opened as a hotel in 2004 as a member of the prestigious Relais & Châ¢teaux group with 33 rooms and suites. The bedrooms are spanking clean with well appointed but minimal decoration and, happily for a grateful traveler, extremely comfortable beds. The bathrooms were beautifully laid out with every need covered. As befitting a five-star property there was the expected bathrobe and slippers, large fluffy towels and a fragrant amenity package. 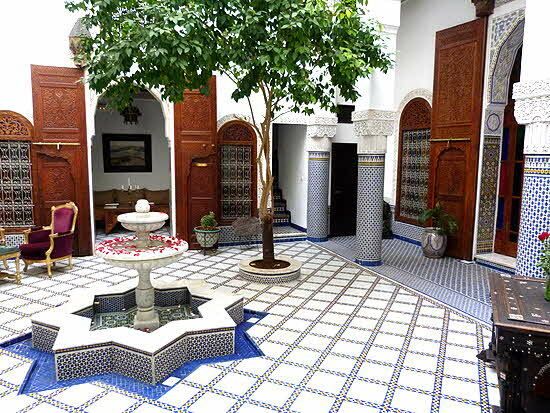 As is traditional in Moroccan architecture, there is a colorful tiled central patio with a fountain in the center surrounded by massive tiled columns and live foliage. Rooms or balconies on the upper floors overlook the inner courtyard which often functions as an interior garden open to the sky for light and air as there were no outward looking windows in the home mainly to protect the privacy of the women of the family. 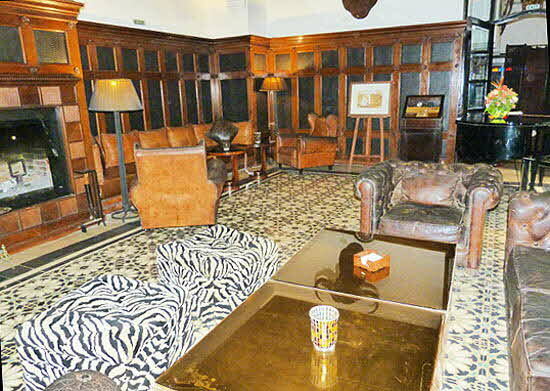 In Heure Bleue Palais there is also the family’s original Hammam, a new billiard and game room, and a stunning English Lounge Bar room and Oriental Restaurant off the patio featuring a massive fireplace and decorated ceiling. 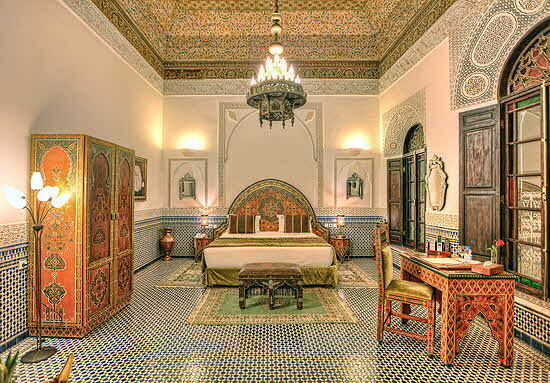 The overall décor is an appealing combination of Moorish, African, Portuguese, English and Oriental. Formally known as Mogador, Essaouira was a major trading port at the crossroads of east and west with a tradition of hospitality welcoming all cultures... with each leaving its mark. © December 2017 LuxuryWeb Magazine. All rights reserved.